A new concept device has been revealed which shows just what you can do with gesture control. Called the Gesture Cube, the black box is your one-stop-shop for accessing apps, social networks and the like – all of which can be done with the wave of a hand. Although it is concept stage, the companies behind the device seem certain that it's going to be a sure-fire hit. "Gesture Cube uses 3D spatial movement tracking to help transform navigating a device into a magical intuitive experience," says the product's website. "The underlying GestIC technology detects your hand´s approach and movements - your favorite apps and media all at a wave of your hand." The partnering companies behind Gesture Cube are: Lunar Europe (product design), Zinosign (user interface) and Ident. There's no news regarding when or if this will come to market but even if it stays as a prototype it's still some of the coolest gesture based technology we have seen. 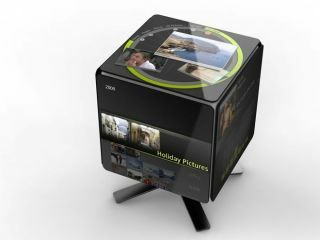 Go to www.gesture-cube.com for more details. Or, if you want to see the device in action, watch the YouTube video below.